Boho Chic Deer Antler Diaper Raffle Tickets. 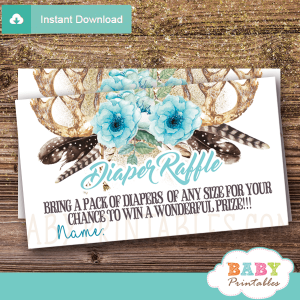 The bohemian themed baby shower diaper raffle tickets feature majestic antlers adorned with a beautiful arrangement of flowers in baby blue accents and feathers against a white backdrop. 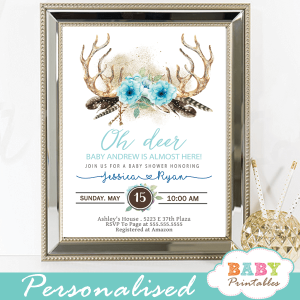 ★ Click here to view matching deer baby shower supplies. 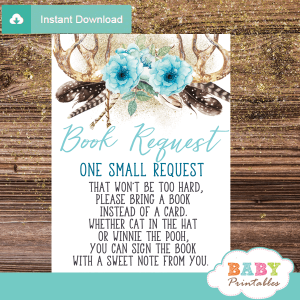 ♥ WHAT YOU GET You will receive 1 digital PDF File (8.5″ x 11″) with: eight 3.5 x 2″ diaper raffle cards per sheet.